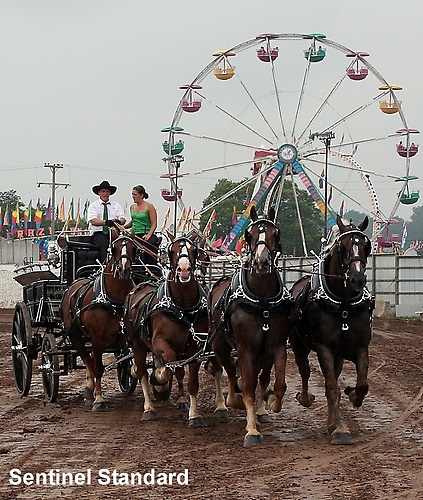 The lazy, hazy days of the Ionia Free Fair. Start with a history of agriculture featuring farm animals and demonstrations,stir in a huge carnival with games and thrill rides, blend with three live entertainment and performances stages, lean towards great products at the Michigan and Marketplace buildings, and wrap it all up with mouth watering fair food from all nationalities of vendors! Now you’ve got the recipe that brings people from all over our state back to Michigan's largest fair year after year. Join the Chamber in our 'Free Fair Home, the Marketplace'. In the building, closest to the front of the fairgrounds you'll discover great businesses, wonderful treasures, and exciting new products for every age. Booth Rates: (10x10 Booth) Early Registration Discounts Applied at Checkout! Rental fees listed are for 1 booth space. Space must be paid in full by discount deadlines to receive discount.